Looking to buy a home? In these cities, prices are attractive, there are plenty of homes to choose from -- and buyers have the upper hand, according to Realtor.com. 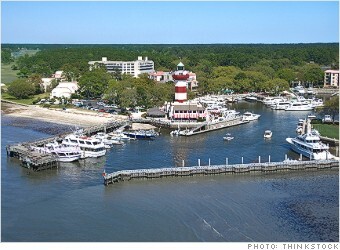 This large metro area in southern South Carolina includes old towns like Beaufort, as well as more modern developments like the resort communities on Hilton Head Island. "[The area] has history and charm without the hassles of bigger cities," said Edward Dukes, a broker with Low Country Real Estate. The region was also the best buyers' market in the nation in February, according to Realtor.com. Home prices dropped 5% from the year before, hitting a median price of $269,900. Homes stay on the market for an average of 156 days, giving buyers plenty of time to shop around and bargain with sellers. But the great deals may not last long. "More deals are closing, there are more multiple bids, and fewer homes on the market," said Dukes. Realtor.com bases its rankings on median listings prices, supplies of homes for sale and days to sell new listing. Housing markets include the entire metro areas.